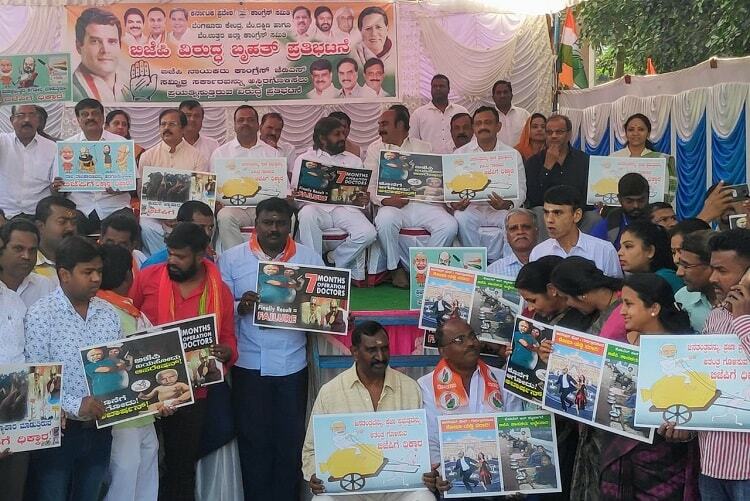 Congress party workers held a rally in Bengaluru on Thursday mocking the BJP for its failed attempt to upstage the JD(S)-Congress coalition government this week. The rally was held at Maurya Circle in the city at 11 am. Speaking about the BJP's attempt, Congress Minister UT Khader said, "I am sure it won't be successful. The coalition government will become stronger with each attempt to take power.” Two independent MLAs - R Shankar and H Nagesh - withdrew their support for the coalition government on Tuesday setting off rumors that the coalition government is under threat. However, Khader along with other Congress leaders at the rally remained confident that no Congress MLA will withdraw support to the coalition government and maintained that all Congress MLAs will attend the party legislature meeting scheduled to be held on Friday in Bengaluru. "Siddaramaiah has called a meeting and we will resolve any issues with disgruntled MLAs," he added. 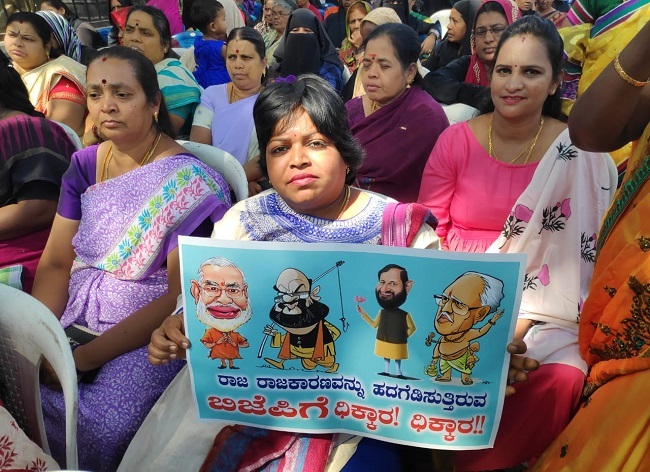 In the protest, Congress workers displayed posters mocking BJP leaders. One of the cartoons depicted Prime Minister Narendra Modi sitting on a wheelbarrow being pulled by a farmer along with the caption, "Down with BJP, which is trying to sabotage democracy and the people's mandate". Another cartoon depicting Modi and BJP Chief Amit Shah alongside a group of horses read, "Down with BJP, which is indulging in horse trading". Another poster read, "Down with BJP, which is trying to destroy democracy". Party workers were also seen sporting masks of BJP leaders Sriramulu, Yeddyurappa, Shobha Karandlaje, Eshwarappa. 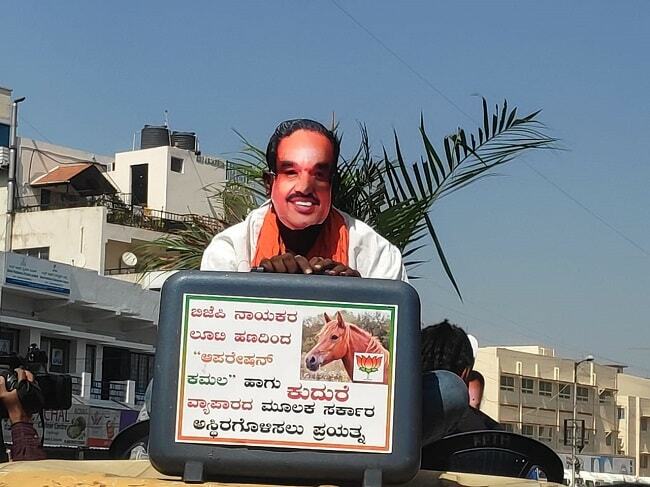 One party worker sporting a mask of Eshwarappa held up a briefcase which read, "BJP is using money they looted to try and come to power doing Operation Kamala and horse trading". Moreover, party workers arrived with flags and chanted slogans against the BJP in the protest that lasted over an hour. Congress leaders Jayamala, Eshwar Khandre, UT Khader and BK Hariprasad took part in the protest. "This is an artificial crisis created by Narendra Modi and Amit Shah. 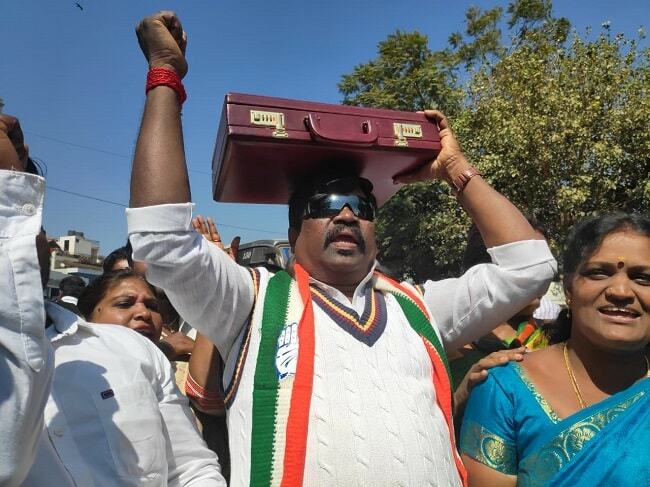 Antics like this will make people lose interest in politics," said Congress MP BK Hariprasad. He also added that the move will backfire against the BJP in the Lok Sabha Elections this year. The party was also bolstered by news that B Nagendra, MLA of Ballari Rural constituency, who was reportedly one of the MLAs holding talks with BJP announced that he will not be switching allegiances. "We were all at different places. That's all. Some people have been saying we will join BJP. Don't believe them. I will attend the legislative party meeting tomorrow. 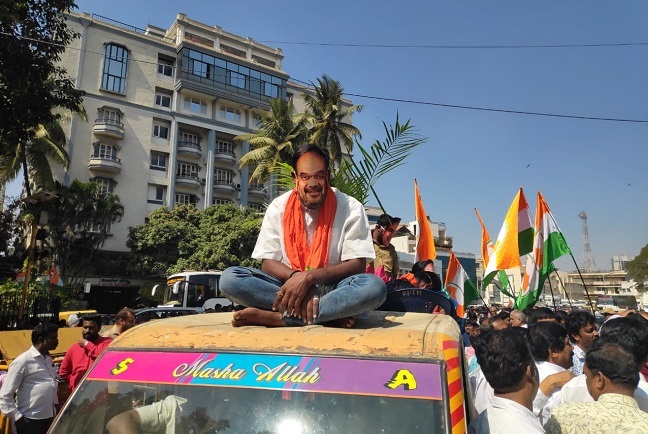 No one is joining BJP," he told media persons on the sidelines of his appearance in a Bengaluru court in connection with the Belekeri port mining scam case. The Congress is set to have a meeting with all its MLAs from Karnataka on Friday to discuss recent political developments and put any news of instability in the government to rest. Meanwhile, BJP leaders who were camped in a hotel in Gurgaon are now returning to the state with the deteriorating health of 111-year-old Lingayat seer Shivakumara Swamy of the Siddaganga Mutt in Tumakuru cited as the official reason.